In September 2014, bombings in Xinjiang’s central Luntai County killed over 40 people, including six civilians, and left 54 injured. Now Xinhua reports that 17 officials from the area have been “punished for dereliction of duty” after the terrorist attack. According to Xinhua, most of the officials were “given serious warnings,” but at least one, the Party chief of Terakbazar township, was dismissed from his post. The Party chief of Luntai County, Lin Fulin, was the most high-ranking official listed in the article as having been disciplined. The move to discipline Party officials serves as a warning that local leaders will be held accountable if a terrorist attack happens on their watch. Xinhua emphasized that “Xinjiang is in the midst of an intensive crackdown on terrorism,” part of which includes increasing pressure on local officials to prevent attacks at their source. Zhang Chunxian, the top-ranking Chinese Communist Party official in Xinjiang, was recently quoted by the official Xinjiang news site as saying that Xinjiang’s “struggle against terrorism has entered a new phase, one that is more complex and more intense than before.” Xinjiang officials must go on the offensive and attack on all fronts, Zhang added. As part of this comprehensive attack on terrorism, China is promoting a “people’s war” against terror. That phrase was in the spotlight again this week, as a Xinhua commentary underscored that China is “using every force in its power to deal a crushing blow to terrorist activities.” China has increased police readiness to deal with attacks, holding anti-terrorism drills across the country. Meanwhile, civilians are urged to give tips about terrorist activities to the police; in some localities, rewards of up to 500,000 RMB ($80,000) are available. The spate of reports in Chinese media this week serves as a reminder that China is not easing up on its fight against terror. 2014 saw a shocking spate of deadly attacks on Chinese soil: the March attack at a Kunming railway station; an attack at a railway station in Urumqi in April; bombings in an Urumqi marketplace in May; and the previously mentioned attacks in Luntai County. 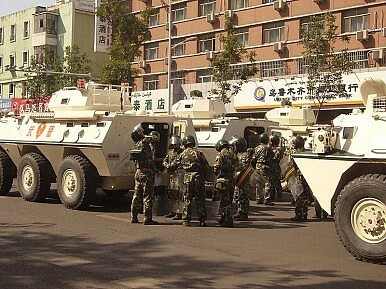 All told, terrorist attacks in China last year killed at least 113 people and injured 368 more. At the time, analysts argued that the deadly terrorist violence of 2014 (particularly the attack in Kunming) would spark a complete overhaul of how China deals with terrorism, in terms of both prevention and response. Counter terrorism has become a new focus for Xi Jinping and his government. That’s true with regard to foreign policy as well. In 2014, China hosted a number of international anti-terrorist drills and consistently raised the issues of terrorism in bilateral meetings with diplomats from around the globe. Growing concern over terrorism has already caused at least one foreign policy shift: China’s unusual willingness to broker talks between the Afghan government and the Taliban. China’s “war on terror” didn’t expire with the calendar year; in fact, the official year-long crackdown against terrorism won’t come to an end until May 2015. Combating terrorism remains high on the government’s list of priorities — and making an example of officials who failed to prevent a 2014 terrorist attack is Beijing’s way of reminding Party members of that fact.